The Humble Administrator's Garden (拙政园) is a Chinese garden in Suzhou, a UNESCO World Heritage Site, and one of the most famous of the gardens of Suzhou. The garden is located at 178 Northeast Street (东北街178号), Gusu District. 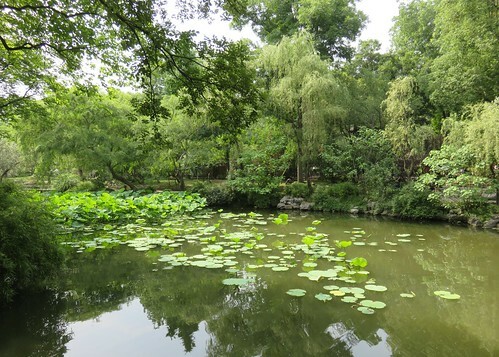 At 78 mu (亩) (5.2 hectares; 13 acres), it is the largest garden in Suzhou and is considered by some to be the finest garden in all of southern China. In 1513, Wang Xiancheng, an Imperial Envoy and poet of the Ming Dynasty, created a garden on the site of the dilapidated Dahong Temple which had been burnt during the Ming conquest. In 1510, he retired to his native home of Suzhou on the occasion of his father's death. He had experienced a tumultuous official life punctuated by various demotions and promotions, and gave up his last official post as magistrate of Yongjia county in Zhejiang province, and began to work on the garden. It took 16 years until 1526 to complete the garden. Wen Zhenming wrote an essay Notes of Wang's Humble Administrator's Garden, and painted Landscapes of the Humble Administrator's Garden in 1533 including 31 paintings and poems to commemorate the garden. Wen produced a second album of eight leaves showing sites in the garden in 1551, with different views but the same poems as in 1533.